In most if not all of his best roles, the Nebraska-born Marlon Brando was an easy avatar for everything anti-heroic about America. A Streetcar Named Desire and The Wild One boosted him to prominence as a post-WWII, hyper-sensitive beast. On the Waterfront was about both a beat-up working class (“text”) and the nobility of informing, even as a means to an end (“extra-text”). Further on in his career, Brando’s Vito Corleone interwove the wisdom and courage of the immigrant experience with the ruthlessness of an American business “success story”, while his elephantine Colonel Kurtz embodied the evangelical derangement that drives most American wars. Arthur Penn’s The Chase casts him in a much different and more iconic role, that of the simple and upright small-town sheriff. His Sheriff Calder is a post-Kennedy era version of Gary Cooper’s Marshal Wil Kane from High Noon, a fatefully inactive hero dressed not in white, but in shades of beige and cream. Brando gives an incredibly understated performance, and when I first watched the film a decade or so ago, he largely sank into the ensemble. 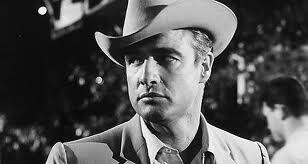 On a second viewing, and with my eye a little more concentrated on Brando, it felt more like that mumbly withdrawal was a key to Calder’s role in the story. I commented last week on Mike Dub’s review of One Eyed Jacks that Brando’s overbearing methods (which include the use of cue cards and earpieces) often have a distancing effect, and co-actors tend to get swallowed up or washed away. In the cases of Terry Malloy, Vito Corleone, Colonel Kurtz, Stanley Kowalski, and his Sheriff Calder here, that detachment is absolutely essential to the character. Like Marshall Kane in High Noon, Sheriff Calder is waiting for a criminal to return to town, and measuring his resolve against the increasingly anxious townsfolk. But in High Noon, the conflict centers around the endangered Kane’s inability to get anyone to help him; in The Chase, those cowering rubes become a bloodthirsty mob emboldened by liquor, and they’re more of a danger to Calder than the escaped criminal. But as I said earlier, Calder is also flawed in his inaction (his first words of the film are, “tell ‘em I’m sleeping,”), and he spends much of the film waiting around for something to not happen. The “New Hollywood” of the 1960’s and 70’s produced a number of toxic takes on American institutions, but no filmmaker was as consistently convinced of the venality at the heart of American society as Arthur Penn. Even Hal Ashby was ultimately a humanist, and Francis Ford Coppola ended up making some decent table wines. During his heyday, from Bonnie and Clyde and Alice’s Restaurant and Little Big Man to Night Moves and The Missouri Breaks, Penn was vicious in depicting the American character as violent, vainglorious, and utterly devoid of moral fiber. Penn was especially hard on the supposed purity of small towns, and The Chase (scripted by Lillian Hellman from a Horton Foote play) is possibly his most poisonous indictment. The people in this fictional Texas town have an ingrained belief in the inevitability of corruption, and they scoff at the idea that Sheriff Calder could be an honest man. They assume Calder is deep in the pocket of Val Rogers, the town’s titan of industry, if only because they would all like to be. The escaped convict is Bubber Reeves (Robert Redford, maybe a little too on the nose), whose criminal notoriety and masculine beauty seem to drive the town into an orgiastic rage. Morals become so base and loose, it’s as though the return of Bubber is interpreted as a harbinger of the apocalypse (or a nuclear bomb). Most Hollywood depictions of American small towns portray the church as the center of community life, but in The Chase, all we see flanking the town square is one dive bar after the next. Beyond the misanthropy, The Chase boasts an amazing cast that also includes Jane Fonda, James Fox, E.G. Marshall, Angie Dickinson, and Miriam Hopkins, as well as a disturbing climax that manages to simultaneously evoke the Kennedy and Oswald assassinations. In the penultimate scene, Penn once again nods to High Noon, as Calder and his wife pack up and leave the town in an act of moral indignation. The only difference here is that no one comes to see them go – they are all too busy sleeping it off, rallying to be part of the next drunken mob.